Most campers usually pack their hammocks when the winter season comes. Winter comes with lots of challenges. From freezing days and nights to heavy snow which at times makes movement from one place to another quite difficult. Who would not want to seek the constant warmth of tents and cabins during these cold nights? I know I would abandon my hammock in an instant. 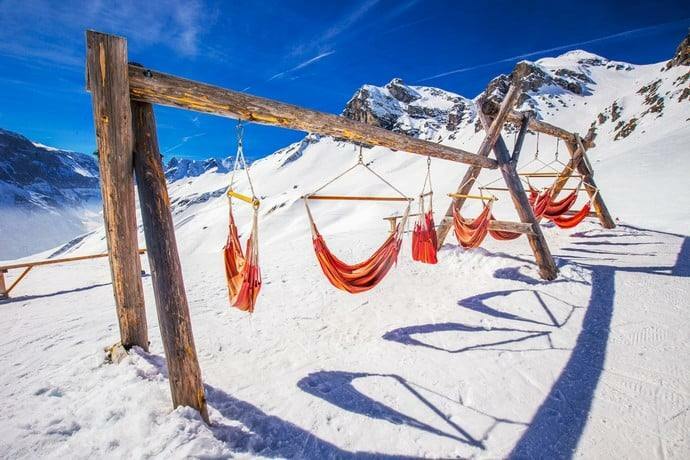 However, winter hammock camping has become very popular over the years. Campers have become wise and innovative, employing multiple tricks to curb the weather and make camping in the winter just as enjoyable as when the grass is greener. Choose where you want to hang your hammock with lots of care. Look for thick trees and natural windbreakers. The wind and the hammock do not get along very well. The trick to keeping warm is insulation from the cold. Your hammock is not exempted from catching a little bit of the freeze and more often than not the nylon comes into contact with your body. A pillow helps in creating a barrier between your head and the hammock’s fibre. Use a pillow as an extra protection even though your sleeping bag will be wrapping you tightly. 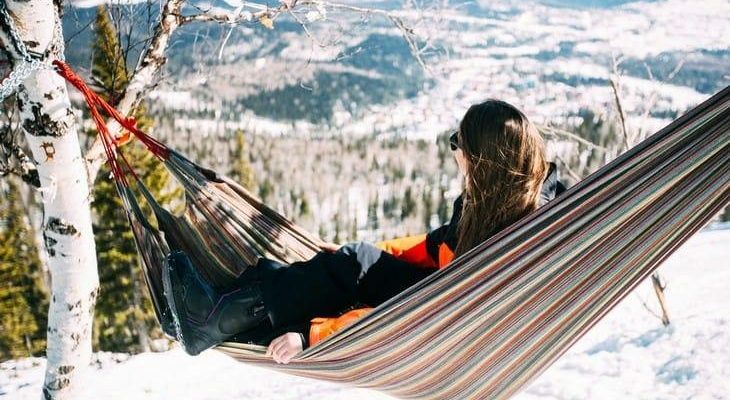 Maintaining your body heat should be top of our priorities when winter hammocking. You should also not lose heat around your body. Tarps are essential for maintaining body heat. The tarps range from those that are hammock specific to standard tarps. The tarps keep in heat and shield you from the preying wind or snow. The downside of using only a sleeping bag while winter hammocking is that your backside does not receive equal opportunity to keep warm because of your body weight. Sleeping pads assist in solving this issue. Inflate your pad partially and rip the benefits of keeping your backside very warm as you lie on it. And do not forget to invest a sleeping bag liner, it is very useful in 4-season or hammocking camping. Sleeping bag liners are incredibly warm and very light. They also help keep the sleeping bag clean during your winter camping. Investing in them is highly recommended as they eliminate cold spots effectively. However, to save the cost, you also can carry lots of warmth. Blankets alone are not that effective in keeping you warm especially when the temperatures drop to inhumane figures. 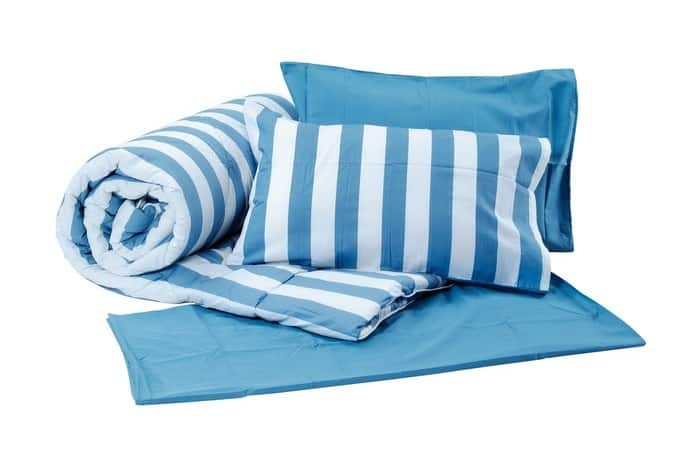 Sleeping bags together with the blankets, however, will come a long way in keeping you warm until the morning hours. You should tightly close the hood around your head living no spaces for air. Stuffing clothes and boot liners as you sleep is also good for keeping warm. Imagine you sleeping in a sleeping bag inside your hammock which is also in its bag. Barriers between your sleeping bag and the hammock are of immense importance during the winter for campers who indeed would wish to keep warm. Insulating pads have worldwide and positive reviews on the magic they perform in keeping you warm. 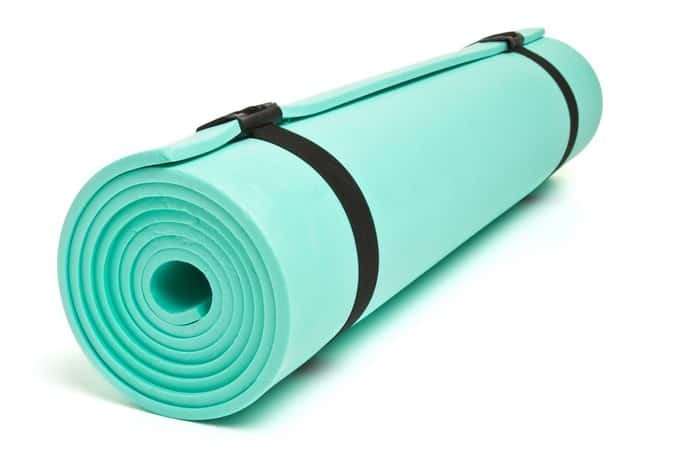 It is therefore advantageous to add that extra layer, and these insulating pads should be at the top of your list when the winter season sets in even though the wrinkling noise they make can be quite irritating. Winter is very mean. You can, however, protect yourself from its cruel nature by acquiring an underquilt which surrounds your hammock. Extra waterproof and windproof blankets can serve as an emergency underquilt. Also, they are very easy to tie around your hammock, from one end to another. Tying blankets around your hammock can prove to be a tedious task especially when it is freezing. Hammock companies around the world have come up with strategies to make campers love the hammock even more. The hammocks come with underquilts tailor made for that hammock. Tying hammocks should, therefore, be a thing of the past. I found the underquilts to be reliable as they also keep my backside warm. Top quilts are very comfortable, and unlike sleeping bags, they do not have a full zipper. Therefore, getting in and out of ‘bed’ provides a minimal challenge. Also, top quilts are readily available as many companies worldwide deal in its manufacture. It is also straightforward to turn a sleeping bag into a quilt. Just zip the sleeping bag up to your calves. The rest of the bag should be laying over you. 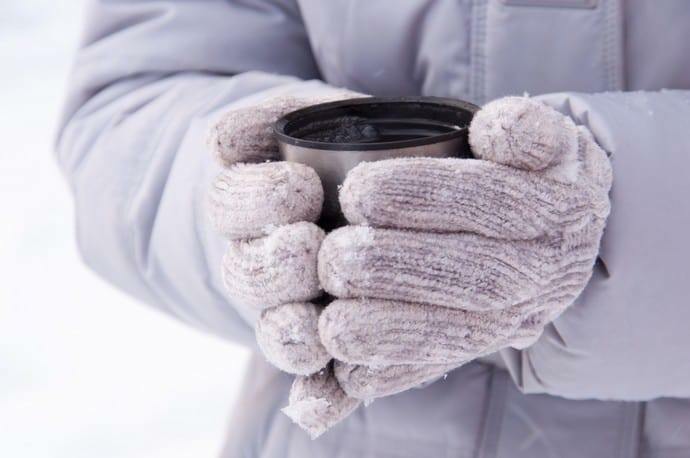 A cup of hot coffee, tea or water around you can provide you with some warmth, at least before it cools off. Before you tuck in, boil some water, put it in a bottle and place your legs over it in the sleeping bag. Of course, your feet should be in protective socks because heat can be dangerous if you treat it with ignorance. Winter hammock camping is not worth dying for, nothing is. Fanatics of camping should learn when to give up and move into a tent or a cabin, especially if the conditions get worse and temperatures drop massively. Pack the necessary equipment and prepare in abundance with all the necessary research if you want to go out in the cold. Make sure to ease yourself into it. No rush decisions. With the tips and tricks as above, campers can conquer the harsh winter season. This list helped me a lot when I was almost losing to the winter season and giving up on hammock winter camping and by the time you read it to the end. By the way, you may find some good tips to warm up your camping trip at an article I have posted before. I hope that these tips will have the same effect on you as it did to me. As always, let me know your thoughts on this article by giving me a comment. You can also add onto the list so that we can all come out triumphant during the winter season like wearing an overcoat or a pair of cold weather boots.